It’s been a week and a half since the new Knights of the Frozen Throne expansion dropped for Hearthstone. 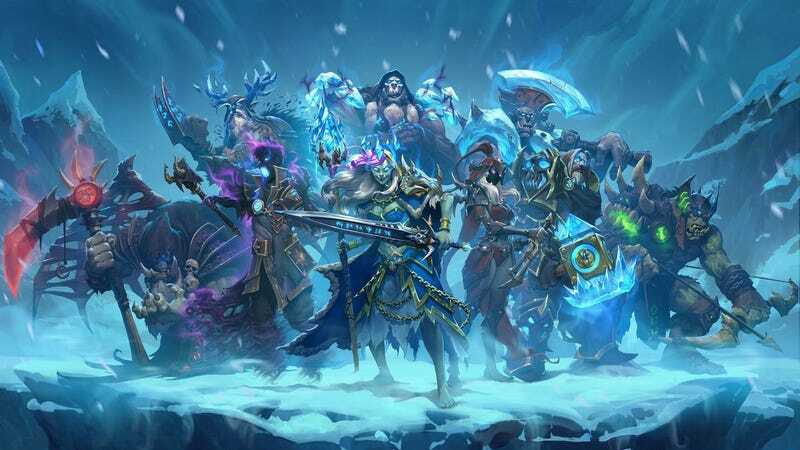 With each new set, there’s always a few growing pains and adjustments, but even in a short amount of time, one thing has become clear: Hearthstone, as it stands right now, is all about the Druids. Normally, when one class gets out of control in Hearthstone, it’s a certain archetype, like Frost Mage or Pirate Warrior. Rarely is it a single class, but Druids in general received a litany of new tools and lost little in the process. Jade Druid is still a potent force, able to build up forces over time with little thought or care. Token players can build a legion of bodies to bulk up and then throw at their opponent, while other decks can ramp up, go aggressive early or rely on a big drop like Malygos. The constant ramp of Druid, through cards like Wild Growth, Innervate and Nourish, has made many of the high-end cards of Hearthstone achievable before other classes have tools available to handle them. Hearthstone strategy site Tempo Storm hosts a meta snapshot, where Tier S is the highest ranking decks. These decks, as Tempo Storm puts it, are “overtuned decks that need to be hotfixed.” The sole inhabitants of Tier S right now? Five Druid decks. Players are catching on, as reddit posters report the majority of their opponents in high-rank matches are Druids, with one data set finding that over 50 percent of players at Rank 1 are using Druid. It’s not hard to see why this is happening. One of the new cards in the expansion, Ultimate Infestation, is possibly one of the best (in a vacuum) cards to drop on turn 10. The card deals damage, draws cards, puts armor on your hero and a 5/5 body on the field, all in one move. Each on its own is rather mild, but in combination, it can be a major blow to the opponent’s tempo. Five-card draw that late in the game can’t be understated, either. Other cards like Spreading Plague can flood the field with more minions, and the Druid’s death knight card Malfurion The Pestilent has a souped-up hero power and even more bodies to drop. Other hero classes are responding, as archetypes like Murloc Paladin and Pirate Warrior can try to combat the constant ramp of Druids. “Exodia” Mage, named for its one-turn kill potential, is even seeing real play, thanks to the slower pace brought on by the ramping Druids. When one class dominates like this, every other deck (at least in competitive play) is forced to adapt or sink. In competitions, this means bringing a deck list that’s prepared to deal with whatever Druid the opponent may be running. For ladder players, it means the only realistic way to climb up the ranks right now is to field a deck that can somewhat reliably counter Druid, or just play Druid yourself. As for solutions? Most of the complaints revolve around Ultimate Infestation and Spreading Plague, two cards that are extremely potent in the current game state with little to no downside, making them obvious candidates for nerfs. Due to the Druid’s base tool kit, it’s easy for players to not just get them on the board, but do it before an opponent can have any answer to it. Jade Druid and other deck types have been effective but manageable in the past, but it’s starting to look like the Hearthstone team will have to step in early with this patch and tip the scales closer to a balanced position.